Unmanageable file sizes. The higher your polygon count, the larger the resulting file will be. In extreme cases, this can cause CAD programmes to crash, as they are unable to handle the volume of data. Time-consuming edits. The higher the polygon count, the longer any edits or adjustments to the model will take. Time-consuming slicing and nesting. The programs used for slicing and nesting need time to run in order to perform effectively. The higher the file size, the longer these processes will take, which can affect your project timelines. Difficult file repairs. A proper file repair process should be well-established in any additive manufacturing operation, in order to ensure the quality of all project data. For large, complex files, this process becomes more time-consuming, and can potentially create delays when it comes to providing quotations and delivering orders. In any of these scenarios, these problems can potentially be resolved by a process of polygon simplification — lowering the polygon count to achieve a more manageable file. However, this must be applied carefully and, ideally, only used when absolutely necessary, as it is not without its risks. Changing a model’s polygon can result in a loss of detail and even result in changes to the model’s geometry. While this may not be an issue for simple, low-detail models, the effects can be dramatic when working with more complex designs, such as architectural models. A balanced approach is therefore required, with practical considerations regarding files’ usability considered alongside the quality of the end result, and polygon simplification applied selectively, only when needed. What polygon count will be appropriate? The correct polygon count will always vary, depending on a model’s geometry and overall complexity. For example, a large, complex part with many fine details might have a polygon count of 0.5m. However, a simpler design with no fine details can have a much lower polygon count without any noticeable effect on the printed result. A phone case (for example) is likely to be extremely simple in terms of its design and the level of detail required, so the appropriate polygon count will usually be quite low. On the other hand, 3D printing an interior trim for a sports car will require a higher polygon count than usual in order to ensure the end result is of the expected quality. If polygon simplification becomes necessary, it is important that proper file-checking measures are in place to ensure the integrity of the model is maintained throughout. 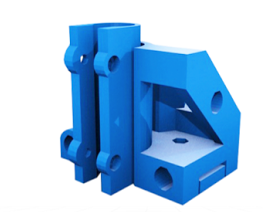 We would recommend using a dedicated file-checking tool to test all CAD files as soon as they have been received from the customer, and again once they have been converted into STL format for printing. The goal during the first check is to ensure that the level of detail is appropriate for the specific model and the printer that will be used, and that the file size will allow it to be processed efficiently. The final check is to ensure that the necessary level of detail has been maintained after any simplification that has taken place during the move between different formats and will not result in any deformation (i.e. visible changes to the level of surface detail) of the printed part. Above all, it is vital that the model’s geometry remains consistent throughout the entire process, with any deformation kept to the absolute minimum. As a general rule of thumb, a maximum deformation of 0.0300 mm will usually prove acceptable, although this will vary depending on the choice of material and the nature of the model. The maximum deformation can be set manually for individual jobs (as most file repair tools allow you to do), but can also be set in advance if you are using an automated tool for file repair. For example, if you have provided your customers with a choice of materials when they place their orders, each material can have the required polygon count stored, and incorporated into the wider file check/repair process. This will be an invaluable time-saver for simple, high-volume requests, freeing your teams of the need to repair each file manually, while still ensuring a professional result. For more complex parts, your teams may need to take a hands-on approach to polygon simplification. For example, for complex, multi-part objects, it may be necessary to detach individual elements and treat the simplification process on a part-by-part basis. This will need to take place before any file repair tools are implemented, as it will not be possible once the file has been repaired and converted to STL format. The key here is to treat automation strategically, using it to streamline the process for routine orders so your team can utilise their expertise to its fullest extent for more complex ones. Finally, be sure to check for common mesh errors throughout the polygon simplification process, as these will lead to poor results, or potentially even render a part unprintable. This should take place before and after the polygon simplification process has taken place to ensure no errors have been reintroduced. If you bear these points in mind and adopt a well-considered approach to the application of polygon simplification, you will be able to avoid any unnecessary delays caused by unwieldy files while maintaining your usual quality standards.